Britain's Home Office used a Royal Air Force base five times last year to deport hundreds of people to west Africa, it has emerged. The military's involvement in the 'Hostile Environment' policy, initiated and championed by Theresa May during her tenure as home secretary, was uncovered by JOE through a freedom of information request. Deportations to Nigeria and Ghana normally take place from London Stansted, a civilian airport, on specially chartered planes. 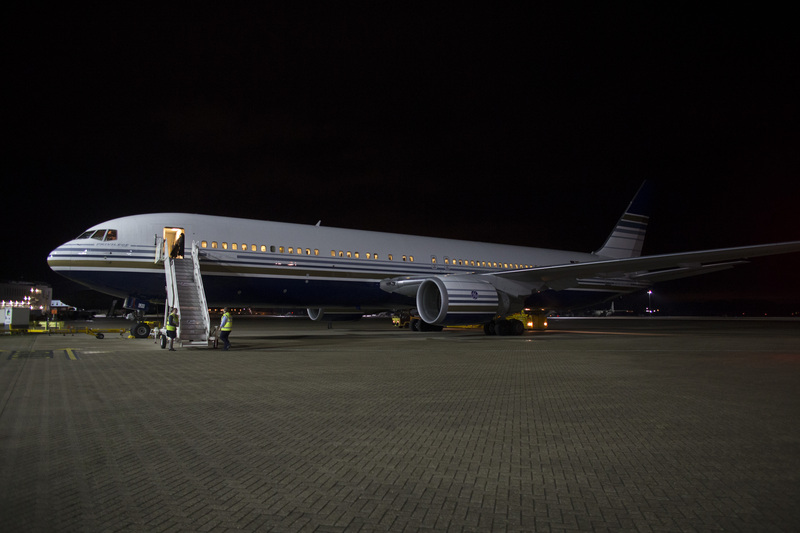 However, the programme appears to have moved to RAF Brize Norton in Oxfordshire, following a major protest at Stansted where activists chained themselves to the wheels of a deportation jet in March 2017. "My parents took me to the UK as a teenager. I'm bisexual and was attacked in Nigeria. A gang kidnapped me and then the police raped me, so we had to leave the country. I went to college in Hackney and have lived in Britain for nearly half my life. "When the Home Office tried to deport me, they put me in a detention centre next to Gatwick Airport. I was suicidal. One night there was a charter flight going to Nigeria and Ghana. My lawyer said they couldn't deport me, but when I came out of the shower these private security guards had packed my stuff. They tied a belt tightly around my waist and wrists, so I couldn't move my arms. "Guards carried me by the belt – I was basically floating. 60 detainees were already on a coach, and I was put in a separate van. I had to move my head down to my hand to use my phone and call my partner. I was crying. The belt was so tight it made me fart. The guards laughed. "I thought they were taking me to Gatwick, but after three hours on the road I noticed a military camp surrounded by barbed wire. There were guys in green camouflage holding big guns. They shouted at the driver asking for details. Even the driver seemed scared. The convoy parked on the runway, near the plane. "The belt was so tight I needed to pee. The guards took me to a military canteen. They kept the toilet door open and it was really hard for me to pull my trousers down. My piss went everywhere. I used my elbow to flush. "At 12.30am, someone came to the van and said I wasn't meant to be on the flight. I was so angry at them. They took the belt off and drove me back to detention. My friends who were on the flight said it left at 4am. The guards battered people. They don't take people to normal airports any more because people protested, so they take you to a military base instead." Campaigners are also alarmed at the RAF’s involvement. One group, End Deportations, say they spoke to a British-born man who voted in the 2017 general election before he was deported to Ghana just weeks later, on the second flight from Brize Norton. Another group, Right to Remain, described them as "ghost flights." Their coordinator, Lisa Matthews, said she was shocked: "In response to peaceful protest, the Home Office resorted to using the military to enforce the brutal policies of the Hostile Environment." Although the Home Office allowed an observer from the Independent Monitoring Board (IMB) to fly on the first flight from Brize Norton, the IMB did not mention the base in its annual report. When contacted by JOE, the IMB declined to comment on the grounds that it "might have a security impact for the Home Office's procedures and undermine the security and safety of detainees concerned." A Home Office spokesperson said: "We do not comment on operational matters."